Since all the excitement of Christmas and New Year we've taken the time to chill out a bit over the past few weeks. We've both settled into daily routines consisting, usually, of work, food, gym (yes, Dan's joined eventually!) and sleep.... all very well for us, but it does mean that the Bloggable material is a bit thin on the ground!! Having said that, there have been a few highlights.... the first being our trip to the Opera House to see Moby. I'll be the first to admit that Mobes (as we've affectionately named him) is not really my cup of tea, it was more for Dan really. Having said that, I was literally blown away by the concert. The sound quality inside the OH is amazing and I even got goosebumps during Flower. I loved the fact the show kept alternating between a civilised 'sit down' affair to a full-blown rave! The atmosphere was fantastic. On our days off together Dan and I usually go to the beach. Although we love Coogee, our local, we've tried to check out a few different ones too. A couple of weeks ago we went to Maroubra, which is south of Coogee. It reminded me of the beaches at home, because it is more rustic and surfy than commercial beaches like Bondi. It was also a lot less crowded, which was a bonus. Last week we took the two-hour bus ride to Palm Beach, the most northern suburb of Sydney. Although the area is great, the thing I was most excited about is that the beach's alter ego is 'Summer Bay' - i.e. the setting for Home and Away (yes, I'm sad). Dan rolled his eyes as I made him take pics of me outside the lifesaving club and doing the iconic stroll down to the beach. No sign of Kim Hyde though.... :-( !! After waiting several weeks to get tickets, we finally managed to see Avatar at the Imax in Darling Harbour. And, it was definitely worth the wait. Dan was like a little kid when we got in there, and I was pretty excited too. It took a little while to get used to the 3D glasses (especially with my dodgy eyesight!) but after a while I just forgot about it and appreciated the sensation of being surrounded by a film. It's the future of cinema for sure.... and James Cameron has set the bar very high. Tomorrow we are going to the Big Day Out - Australia's Glastonbury but, as the name suggests, for one day only. There are some great acts playing, including Muse and Calvin Harris, so it should be good. Bit concerned about the weather forecast though - 42 degrees!! Better make sure we take lots of suncream and water... bit different to Glasto... well, the suncream bit anyway! Where did that year go...?!? Firstly I would just like to say that I hope you all had a great Christmas and all the best for 2010...! Christmas this year was a little different to other years as it was the first one we both have had away from family back at home. Jo told me that she didn't get me anything this year because we were saving but that all changed when I woke up to a load of prezzies on the bed!! She got me a t-shirt, mug, incense sticks and some candy. I bought her a necklace, Robbie's new album, a soundtrack to a cute film, some nibbles and vouchers for two clothes shops as I know that she has been wanting a change to her wardrobe...! Once we were dressed we headed to our local beach, Coogee, with our picnic. When we stepped off the bus all we could see was a wave of little red hats. Seeing everyone in Santa hats near the beach was a bit surreal but 'normal' at the same time! The picnic was really yummy and we finished just in time, as it started to drizzle. It was only moderate until we got home and then it started to rain properly. We both couldn't believe it was raining on Christmas but that wasn't going to ruin our day. Once we got home we played a game that I got from Nichola and Dave; Pick-up-sticks. This, along with a bit of festive telly, made it feel more like Christmas. Later that evening we Skyped my Mum and Dad which was nice. It was weird not being there but after a chat and a toast it almost felt like we had popped in to join the celebrations! We also had a nice long chat with Jo's Mum and Dad over the phone and wished them a Merry Christmas that evening, followed by another fun festive Skype on Boxing Day to them and Granny and Grampy. Each Boxing Day Sydney hosts the start of the yacht race to Hobart. We wandered down to the harbour to see what was going on. You could just about make out the boats on the horizon. There were lots of spectators there but before we knew it the race had started and the yachts had gone! Jo had work that evening so we walked back through the city on the way to see what sales were on. All the shops were stupidly busy. We attempted two shops but after nearly getting squashed to death we headed back home! The next few days after Christmas were lazy for me as my work place was closed for nearly a week! Jo had to work for most of the week but we still found time to do a few things together. The local cinema is just up the road so one evening we went to see Sherlock Holmes. We both really enjoyed it. I won't bore you with a review but I highly recommend it. With Christmas feeling a bit strange this year we held out for a 'normal' New Year's Eve. Our American friends that we met at the beginning of our travels said they were heading down to Sydney to meet up and see the New Year in with us. It was really nice to see Courtney and Cory again and hear how they have been getting on. They have been in Newcastle for the past two months. They were only going to stay there for a couple of days but things changed and they ended up staying longer (sounds like Melbourne Jo!) The theme for the evening was to wear a touch of blue so we all tried our best...! 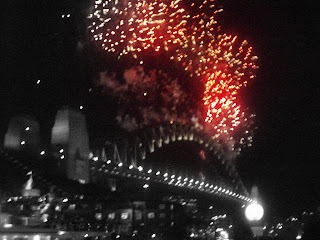 We headed down to the city around 3pm to try and find a good spot to see the fireworks. We walked around for a while but ended up staying at Campbells Cove near The Rocks, which is one of the vantage points for the fireworks. We couldn't believe how busy it was and it appeared that a lot of people had been there all day or had camped out the night before! Once we got into position we waited for the first display which was at 9pm. I think they were for families and youngsters, as a few people headed home after. We had three hours until midnight and Jo wanted to get a drink. I looked around and thought it would be wise to stay put as most people around us had sat down. It took us long enough to get where we were by manoeuvring around people and nearly standing on fingers, so staying put seemed wise. After the 9pm fireworks there were more at 10pm, 11pm, 11.30pm, 11.45pm and then the grand finale at midnight. The atmosphere was amazing. There was an overhead speaker that was letting everyone know how long it was until midnight. Everyone counted down the last 10 seconds and before we knew it 2010 was here and the display had started. It is hard to describe the experience but seeing the Opera House and the Harbour Bridge light up and witnessing it with 1.5 million other people was such an honour for us and another memory for the box! After the fireworks had finished everyone wished each other a Happy New Year. We walked back up George Street and headed somewhere to get some grub - we needed it! The streets were so busy and there were lots of police around including police on horseback. The atmosphere was amazing as people were playing music in the streets and just generally enjoying the celebrations. As you can imagine the roads were packed and each place selling food was bursting at the seams. We managed to get some food and then caught the train back to Newtown. The night went so quick but overall it was one to remember. Courtney and Cory had to catch the train back to Newcastle so we went out for lunch and wished them a safe journey. They are due to fly back to America in February but they are thinking of staying until May. Either way they said they will call through and spend the last few days with us before they leave. So there you have it, another year has gone. 2010 will be an exciting year and I hope you enjoy hearing all about it. Happy New Year everyone!! !